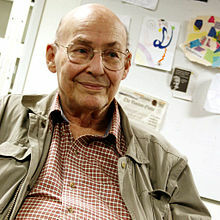 Marvin Lee Minsky (August 9, 1927 – Januar 24, 2016) wis an American cognitive scientist concerned largely wi research o airtifeecial intelligence (AI), co-foonder o the Massachusetts Institute of Technology's AI laboratory, an author o several texts concernin AI an filosofie. ↑ Minsky, M. (1961). "Steps toward Artificial Intelligence". Proceedings of the IRE. 49: 8–1. doi:10.1109/JRPROC.1961.287775. ↑ Minsky, M. (1988). "Memoir on inventing the confocal scanning microscope". Scanning. 10 (4): 128–138. doi:10.1002/sca.4950100403. ↑ Hillis, Danny; McCarthy, John; Mitchell, Tom M.; Mueller, Erik T.; Riecken, Doug; Sloman, Aaron; Winston, Patrick Henry (2007). "In Honor of Marvin Minsky's Contributions on his 80th Birthday". AI Magazine. 28 (4): 109. doi:10.1609/aimag.v28i4.2064 (inactive 2016-11-05). Retrieved January 26, 2016. ↑ Papert, Seymour; Minsky, Marvin Lee (1988). Perceptrons: an introduction to computational geometry. Cambridge, Mass: MIT Press. ISBN 0-262-63111-3. ↑ Minsky, Marvin Lee (1986). The society of mind. New York: Simon and Schuster. ISBN 0-671-60740-5. The first comprehensive description of the Society of Mind theory of intellectual structure and development. See also The Society of Mind (CD-ROM version), Voyager, 1996. ↑ Minsky, Marvin Lee (2007). The Emotion Machine: Commonsense Thinking, Artificial Intelligence, and the Future of the Human Mind. New York: Simon & Schuster. ISBN 0-7432-7664-7. ↑ Winston, Patrick Henry (2016). "Marvin L. Minsky (1927-2016)". Nature. Springer Nature. 530 (7590): 282–282. doi:10.1038/530282a. PMID 26887486.